Today a client with fondness for the video games of his youth chose to enshrine symbols of his favorites in this custom tattoo. 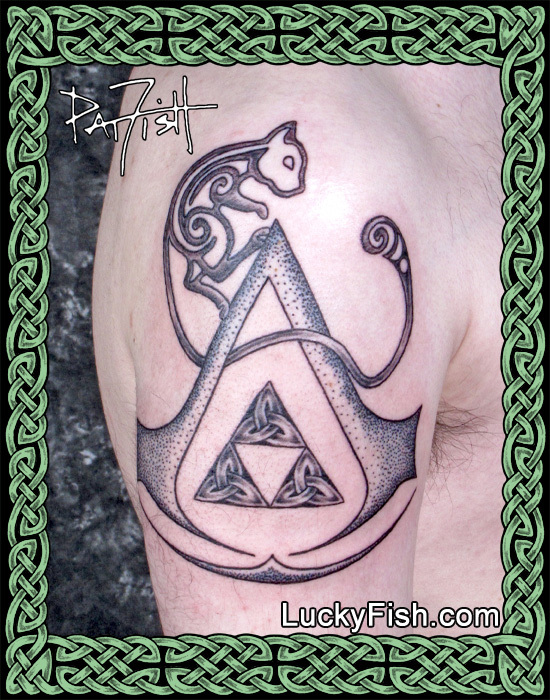 At the center is the iconic Triforce design from 'The Legend of Zelda' series, rendered with a Celtic twist. Framing that is the stylized A from the "Assassin's Creed' logo. Climbing the A is a graphic representation of "Mew" - a mysterious and rare cat-like creature from the Pokemon media franchise. An eccentric and nostalgic tattoo for a child of the digital generation!